In this image from the Envisat satellite, clouds cover the North Sea and sweep down to the strait between Denmark (lower-right corner) and Norway (upper-centre). In this beautiful space wallpaper, clouds cover the North Sea and sweep down to the strait between Denmark (lower-right corner) and Norway (upper-centre). 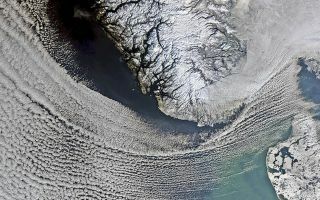 In the upper-right corner, a thicker blanket of clouds covers south eastern Norway and spreads into Sweden. Located on the Scandinavian Peninsula, Norway is Europe’s northernmost country and is famed for its fjords. Some of these are visible in the image as dark lines between the white and snow-covered land. Near the top of the image, we can see part of Norway’s longest and deepest fjord, the Sognefjord. In the lower-right corner, we can see part of Denmark’s Jutland peninsula, with small and large bodies of water speckling the flat terrain.